There is a parking garage directly across the street, Ellis - O'Farrell Garage. There is live jazz nightly in the upper level dining room. Cancellation policy: A party of six or more must be confirmed with a valid credit card. Any cancellations must be made prior to 24 hour of reservation to avoid a $25 charge per person. This policy also applies if you need to reduce the number of guests in your party. 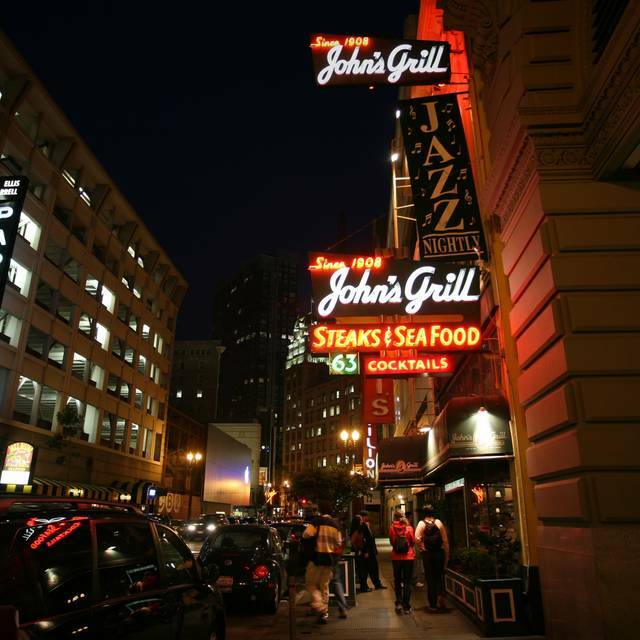 John's Grill has been a San Francisco tradition since 1908. 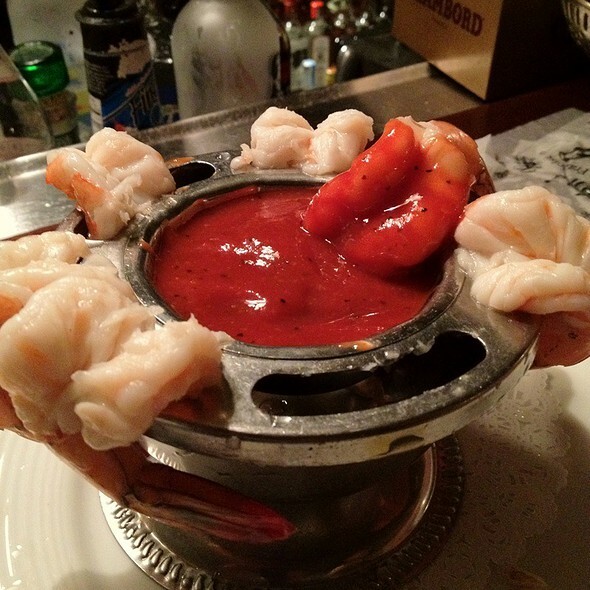 This historic restaurant is one of the city's oldest and most famous and is a favorite of celebrities who enjoy great steaks, expertly prepared fresh seafood with excellent service and a one of a kind atmosphere. 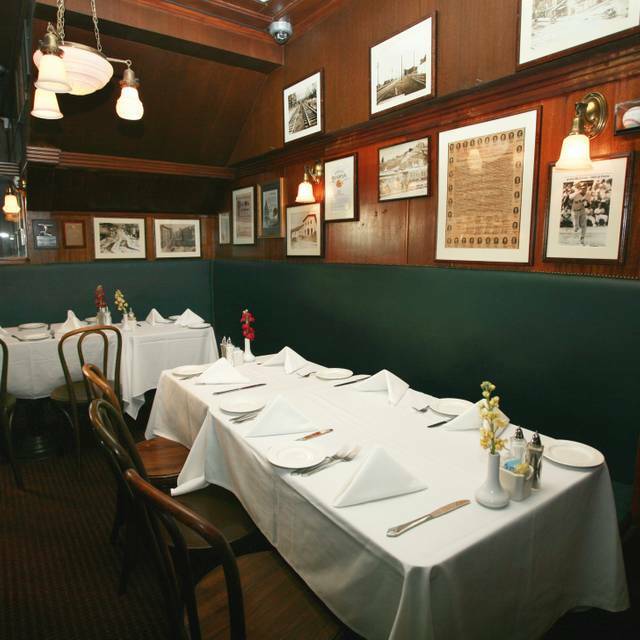 John's Grill was a setting in author Dashiell Hammett, The Maltese Falcon. The restaurant has earned many tributes: it has been chosen as one of the 10 best by Esquire and featured in Gourmet Magazine. Live jazz nightly in the upper level dining room. 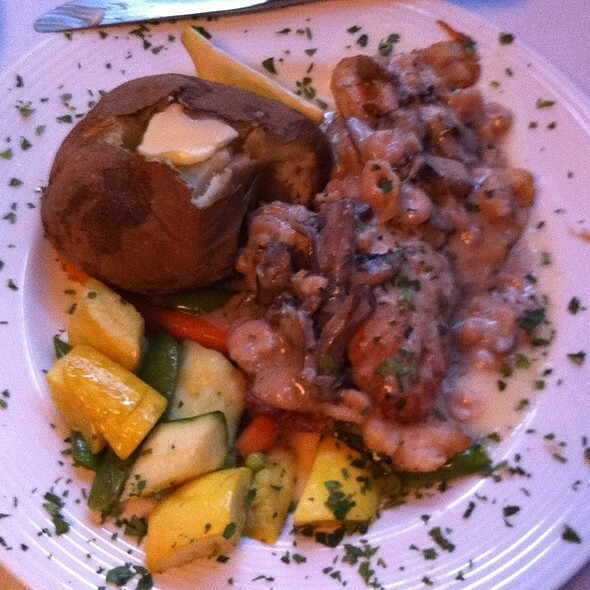 Zagat Rates John's Grill - #1 Steakhouse in Downtown San Francisco!!! Although it's 110 years old, John's Grill is a recent find for me. Have been there 4 times since November 2018, and each time a very good experience. Definitely "old San Francisco", with a great ambiance. Each time, good food and service. Great conversation at the bar also. I lived in San Francisco for many years and even after leaving I continued to return frequently. John's grill is always on my top list. I like everything about the place. If you want a feeling of old San Francisco and true city this is the spot. Love this place. Brought my new girlfriend there!! It was just all ok. There was nothing to complain about, but the steaks were alright. Most cities have some wonderful steakhouses on offer, upscale chains or homegrown heroes. This place has some history, but needs to offer food a step up from Outback. It was our 40th Anniversary. Staff was great, it might have been what I ordered as they changed a recipe to gluten free. Great food and awesome service. Everything we had was so good. But save room for dessert. We haven't been here for ages and thought to try it after the theater. We were early and they seated us anyway. The tables are close together, but we had fun conversations with the tables along side us. 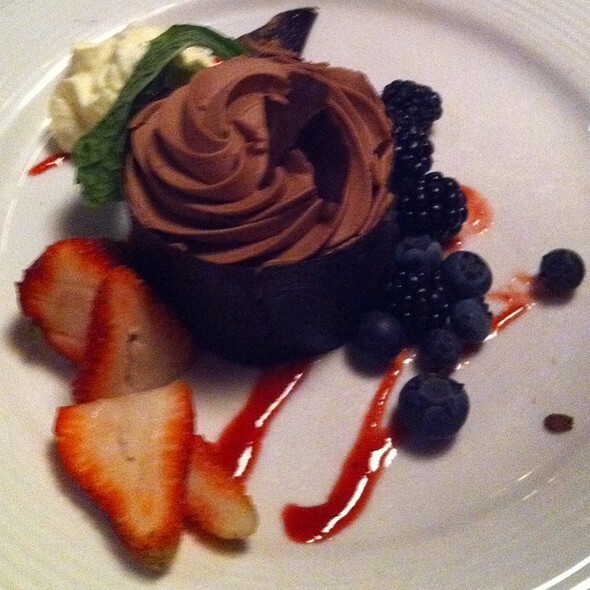 The food was fabulous and Curtis, our server, provided the perfect customer service. We have to go here more often when we are in the city, especially how close it is to BART. Good seafood dining experience with attentive wait staff. Bread comes immediately and is fantastic. Lobster bisque was tasty but bowl size seemed shallow and it was not piping hot. Salads were decent. Great dressing but despite heirloom tomatoes it was still too early for tomato flavor. Halibut was really salty. Service was terrible and the additional 25% that was tacked on our bill for a surcharge and mandatory 19% really sucked. Cenamos fenomenal , nos atendió Chris , una persona muy educada muy amable y muy profesional . Alta calidad de la carne, hecha al punto justo en el que la pedimos. Un restaurante muy recomendable para comer carne exquisita en San Francisco. Classic steak house menu, excellent preparation and awesome atmosphere. Always a great meal. Love the old school style decor, this place made me feel like I was in the movies The Godfather or Goodfellas!! Can you believe the author of the Maltese Falcon actually dined and wrote part of the book here, that’s amazing. The food was delicious we ordered a cioppino, seafood cannelloni and the lamb chops. Our sever Jose was amazing he helped us and explained each and every plate we asked him about. The drinks were actually really good a bit strong but delicious. Overall our experience here was amazing, definitely coming back whenever we’re back in town. Thank you johns grill!! Good Service, affordable price. I will use this restaurant again. Very very noisy but the antique wood panels that cause it are magnificent. Excellent service but the food was just ok. Even with reservations there was a wait. John's Grill is a SF icon, and is still going strong. Food was good -- there was a mix-u[ with the steaks ordered (all 3 were under cooked for diner's tastes, and had to be sent back) but the issue was taken care of cheerfully and the waitstaff couldn't have been more accommodating. Overall the experience was great. Always a nice evening out. My husband loves their lamb chops. We enjoy a pre-theater dinner here a few times a year and it never disappoints. 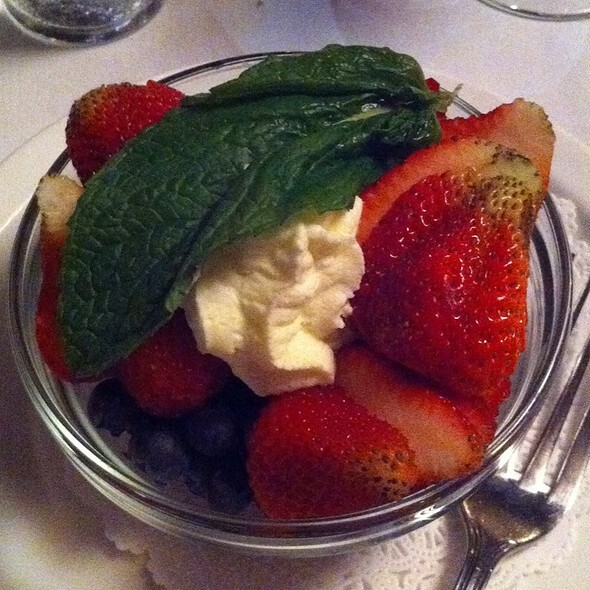 John’s is always a wonderful experience! Whenever I visit San Francisco I make sure to have a meal there! We went to John’s Grill last night before going to a show. The room shows a lot of history and upstairs where we sat, there was a jazz guitarist playing. The tables are really close together so forget about a private conversation. The food was good, but not great. We each had fish, halibut and sea bass, and while the portions were large, the fish didn’t have much taste and the baked potatoes and string beans were a bit dated. Something more creative and tasteful would have been appreciated. John’s Grill is an institution, but the food feels institutionalized. Was disappointed in the quality of the food. Am not a fan of a lot of sauce on top of fish but that's what I got. Vegetables were sparse and tasteless and baked potato too large for my taste. Not a memorable dinner. Have had positive experience at John's in the past, but it was a bit disappointing this time we were initially seated upstairs and the noise was so great, we literally had to yell at each other over the small table. Before even getting our water, we decided to leave. On a good note, a server/host noticed, and we're very understanding. They offered seating on the first floor which we accepted. The sound level was much more tolerable. The subsequent service was very good, and while the food was OK, it wasn't to the point of being above average or excellent. Would probably try again next time I'm in town, but wouldn't go out of my way to do so. There was a dead fly in my water cup that I fished out. The tables are spaced so close together that you can have a very friendly conversation with the party next to you. The food is average at best. The wait staff are good and friendly people. Food is just not that good. Unsure why since they have been in business for a very long time. Normally, I’d write a great review for John’s Grill. But my lunch was a “meh.” My steak wasn’t that great. And the whole meal was a bit cold. As I ate my steak, I’d get these tiny chips of bone (3) during bites. Not the best meal by far. We always have good food, good service and I just love the feel of "Old San Francisco" that the interior has. It has an elegant San Francisco ambience to it. Love it! My third time coming to johns grill, and must say once again everything was perfect!! Decided to come in and celebrate my girlfriends birthday, and this place seem more than perfect since we’re both fans of steaks and seafood. Our server was amazing he recommended a wonderful pomegranate martini and must say it was so good we ordered a second. We had the lamb chops and cioppino everything was amazing and cooked to perfection. At the end of the night our server dropped off a lovely homemade flan with a candle set up beautifully for my gf, even had the guitarist played Happy Birthday for her. Once again thanks Johns grill for another amazing meal definitely made my girlfriends birthday a night to remember. Fruit flys greeted us at the table. Server delivered my wife's chicken dish cool/warm, and the wrong type of steak to me. Waited for the correct steak while my wife ate her cool chicken. Server never apologized, said a word, after clearing our meal, he just walked up and plopped a plate of Crem Brulee in front of us without a word, offered us coffee or dessert - bizarre, like that would make us happy. We don't even eat it! Won't go back, and if anyone goes, bring big spray (killed 3), and hope for a better time than we had. Great find! Not to be overlooked! I don't now if it was the Open table reservation but I felt Like I was crammed into a tight table next to the musician. felt a little put out. Great old restaurant. Good cocktails and meat and potatoes. Fish options good too. Booked a special dinner for anniversary we both had fish... food was delicious! Our waiter was a little excited! Luckily I changed our reservation to 6pm because by 6:15 you were crammed in like sardines and there was a loudest salesman in the room competition going on.... not very intimate although we had a great table initially! First time here and we’ll be back! Food and service was outstanding! Steaks were so tender and flavorful, escargot was heavenly.